Posted on Tue, Feb 19, 2013 : 5:58 a.m.
Eastern Accents in Ann Arbor plans to close in March after 17 years downtown. 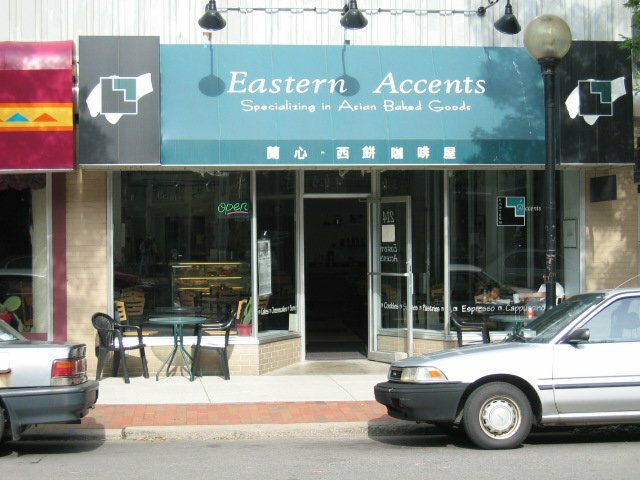 After 17 years in downtown Ann Arbor, Carol and Ben Sun are planning to close their Eastern Accents Asian bakery in March. “We would like to thank our customers for their patronage and support of our small, family-owned business,” the Suns wrote in a statement. They opened Eastern Accents at 214 S. Fourth Ave. in 1996, serving fresh-baked goods and tea, among other items. The bakery will close for good at 7 p.m. on March 16. The decision, according to a news release, was spurred by a dispute with the landlord. 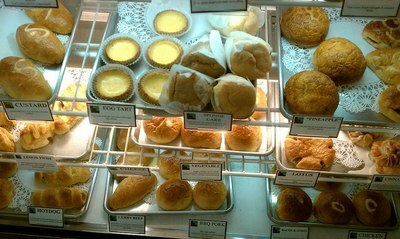 A food case at Eastern Accents in downtown Ann Arbor, which is known for its popular baked goods. “A long-simmering dispute with our landlord has finally come to a head and we’ve decided that it is time for a change,” it says. Eastern Accents is located in the Town Center Building at 210 S. Fourth Ave., which local landlord Dale Newman purchased in 1995. The bakery is next to Bandito’s Mexican Restaurant. Newman has faced foreclosure several times, and the building is in a redemption period after mortgagee Bloomfield Institutional Opportunity Fund LLC foreclosed last year. According to filings, the mortgagor owes $1,291,089, and the building's future is unclear as ownership could transition in the coming months. The Suns didn’t provide details of their dispute with the landlord, but Carol said the timing is right. “My husband and I have aging parents that we would like to be more available to and that is one of the big factors in our decision,” she said. Carol said Eastern Accents garnered a loyal following throughout the years and thanked her customers for their patronage. She said they’re not looking at other spaces to possibly relocate the bakery. “We’ll try to do business as usual until we close,” she said. Gift cards will be accepted until Eastern Accents closes on March 16. “We’re looking forward to new adventures,” she continued. Thu, Apr 4, 2013 : 1:11 p.m.
Just now hearing about this! I'm so sad - I would have visited before it closed had I knew. I used to come here regularly when I was an undergrad ('05-'09) and I loved all of the Asian specialties. Tue, Apr 2, 2013 : 3:17 a.m. I wish the owners could see the comments. I wish them happiness in their new adventures and I will miss this place. I've had very fond memories of Eastern Accents. This is a place I will never forget. Sun, Mar 24, 2013 : 2:27 a.m. The year they opened is the year my husband proposed. Our first date he took me to a lunch date in a nearby park.. he opened a paper bag and gave me a chicken bun. I was hooked on both. They even made his grooms cake for our wedding. Cheesecake with a yin yang symbol on top. We've gone there countless times over the yearrs. I cannot say how much I will miss them. I bought 3 dozen buns and have them frozen. It is sad to think we cannot spend a Saturday strolling Ann Arbor and then stop by our favorite place for a snack or meal... I'm truly sad. It's been in our lives since the beginning. Wed, Feb 20, 2013 : 5:31 a.m.
Several marriages and families have resulted from folks meeting at the bakery. It's where I met, and later proposed to my own wife. :-) Ben and Carol built an amazing extended family of loyal customers and employees over the years. A website tribute to the bakery I set up almost exactly 15 years ago, to the day: http://www.eaccents.com Thanks for all the memories. You will be missed! Wed, Feb 20, 2013 : 2:18 a.m. The Espresso Cake . . . a pure taste of my childhood in Southeast Asia. Carol, say it isn't so, but wishing you all the best! Wed, Feb 20, 2013 : 1:29 a.m.
Our three kids have had birthday cakes form Eastern Accents at various points in their young lives. While we were members of the Y, we used to stop there every week to get cheese buns on our way to swim lessons. We have lots of good memories of the place. We wish Carol and Ben Sun the best of luck, and we thank them for their dedication to good food. Eastern Accents has never closed for 3 months at a time. They close during art fair, like other downtown businesses. It's a testament to what a great townie haven it is. Their regulars are locals and students craving a taste of home. And God forbid that a family-owned small business close for federal holidays or for vacation. But don't worry bun hater, McDonald's will still be open for you. Tue, Feb 19, 2013 : 11:28 p.m. I guess that 3 months when they closed EVERY summer wasn't quite long enough a break for them. Tue, Feb 19, 2013 : 11:08 p.m.
Tue, Feb 19, 2013 : 9:53 p.m. Does anyone know about what the other businesses in the building are going to do? Sat, Feb 23, 2013 : 3:22 p.m.
Banditos and the salon are most likely in the same boat under same landlord. Not sure what will happen to them yet. Tue, Feb 19, 2013 : 6:11 p.m.
Love your restaurant! We will miss you so much! Thank you for all of the wonderful food and memories. Our very favorite place in town for a delicious and leisurely after school snack/early dinner or dessert. Wedding cakes for my husband and me, my daughter and son-in-law, and close family friends. We will miss you but wish you all the best with your new adventures. Hope that you'll consider the cookbook idea. Tue, Feb 19, 2013 : 5:49 p.m. NOOOOO!!! OH NO! I will miss the reliably delicious mango cake, pork buns and chicken buns. Then there's the great QUALITY tea selection, the lotus buns, and the stir-fry when I want a big lunch. All AFFORDABLE (rare downtown), in a relaxing atmosphere (even rarer) where I could go to collect myself on a hectic day. Where will I find any of this stuff now? Tue, Feb 19, 2013 : 5:39 p.m.
Tue, Feb 19, 2013 : 5:13 p.m.
Eastern Accents was ok, but stopped going when they started having irregular hours (closing for all school breaks and for a real long time every summer). Tue, Feb 19, 2013 : 5:04 p.m.
Tue, Feb 19, 2013 : 5 p.m. NOOOOO!!!!! There goes one of the only comfy homey reasonably-priced places left in Ann Arbor. Thanks to the Suns for providing Eastern Accents and best of luck to them in their new adventures, but, please will someone carry on with a home-y place for buns like these?! Tue, Feb 19, 2013 : 4:17 p.m.
Any chance we could get an Eastern Accents cookbook before you go? I can't imagine life without an occasional curry bun treat from this cafe. This cafe is my favorite in Ann Arbor because of the great food for a good price, and the quiet atmosphere. I'm happy for the owners' new stage in life though; it sounds like it's the right time to move on. EA will be missed!! WOW. This is a great idea! And could provide them a bit of a continuing income stream! Tue, Feb 19, 2013 : 3:58 p.m.
Tue, Feb 19, 2013 : 4:05 p.m.
Tue, Feb 19, 2013 : 2:48 p.m. Very sad to hear this! I will miss your goods. I still remember the first one I had, pork bun followed by bean paste bun, and I have never been the same since. DEEELICIOUSNESS. Tue, Feb 19, 2013 : 2:12 p.m.
Tue, Feb 19, 2013 : 2:09 p.m. This will be a real loss - I also really enjoy EA. Definitely some of the best, reasonably priced Asian around and I don't know of anywhere else that serves such great fresh food! I am not buying the landlord excuse. If he is currently in foreclosure redemption period it is unlikely he will continue to be their landlord in the very near future. If you are going to cite that as a reason for closing, tell people the issue. If you want to spend time with your aging parents just say so. If you are tired of the business, or can no longer make enough money or whatever your reasoning, but blaming the landlord seems like trying to make yourself look good and blaming someone else. Sat, Feb 23, 2013 : 3:28 p.m. The landlord still hasn't provided heat amongst other grievances. A management company has stepped in and playing hardball with the tenants. They did not wish to get into the details and we should respect that. Best of luck to the staff at Eastern Accents! Tue, Feb 19, 2013 : 7:04 p.m.
@tony livingston: Carol did say it's in her husbands DNA to be a small business owner when I asked if they would open another business. Tue, Feb 19, 2013 : 6:40 p.m. I find it totally believeable. I remember being in there a few years ago when the landlord did not pay his bills and there was no heat. I think the owners just got sick of spending so much time and energy with all of his problems. In a restaurant/bakery, the hours are long and the work is demanding and the owners probably just want to do something else for a while. I wish them well and my guess is that they will eventually resurface with another business of some type. Tue, Feb 19, 2013 : 6:14 p.m. Odd. Why the anger? And why would they look &quot;bad&quot; because they are closing no matter what the reason? I think the fact that they did not elaborate on it shows quite a bit of class. Tue, Feb 19, 2013 : 5:58 p.m.
Tue, Feb 19, 2013 : 5:05 p.m.
Dale Newman. That's all you need to know. Tue, Feb 19, 2013 : 3:51 p.m.
johnnya2 you have obviously never met, or had to deal with, Dale Newman. Tue, Feb 19, 2013 : 2:46 p.m.
Or...it could be the truth, the landlords history speaks volumes. It's amazing they lasted so long dealing with Newman. Tue, Feb 19, 2013 : 2:25 p.m.
Tue, Feb 19, 2013 : 2:01 p.m. This was one of the really wonderful places in downtown Ann Arbor. Carol and Ben are among the really wonderful people as well. Ann Arbor will not be the same without Eastern Accents. Thank you Carol and Ben for all the tea, apple turnovers, and the best raisin bread ever. Tue, Feb 19, 2013 : 12:28 p.m. I will miss the mango cake *sigh*. Tue, Feb 19, 2013 : 11:42 a.m. If they are not declaring Chapter 7 or 11, there are state rules on gift cards they have to follow. Tue, Feb 19, 2013 : 12:09 p.m.
Tue, Feb 19, 2013 : 11:51 a.m.
Erm... yeah. I'm sure that's not going to be an issue but thanks for the detective work. Tue, Feb 19, 2013 : 11:37 a.m.
Oh no! EA will be missed. Tue, Feb 19, 2013 : 11:29 a.m. This makes me very sad. Best of luck to the Sun family with all future endeavors. The deliciousness is going to be missed. Tue, Feb 19, 2013 : 11:25 a.m.
Oh no! They make one of my favorite types of cake there! It's our go-to cake for birthdays and special events. So sad. They really made great quality goods. Plus they had nice staff. I will really miss them! Tue, Feb 19, 2013 : 2:13 p.m. I think they've had some of the best staff in Ann Arbor over the years. Sad to see the shop close. Tue, Feb 19, 2013 : 11:18 a.m.
Man, that REALLY stinks. One of the very few places in downtown A2 I had a consistent favorite that always hit the spot whenever I thought to get it (those steamed pork buns are amazing). Only a handful of places actually have a good, unique, authentic, and reasonably priced offering; some have some combination of those, but very few have all. Eastern Accents was one of them. I hate that they're leaving. I wonder if those buns freeze well. Anybody know? I was excited about that Wafel Shop place, but my (admittedly good, but not unique) single waffle and coffee was $10. I mean, c'mon. Wed, Feb 20, 2013 : 1:35 a.m.
And yeah, the Wafel Shop is great, but WS and EA are completely different businesses. Wed, Feb 20, 2013 : 1:33 a.m. There will be a mad rush for those buns. If they freeze well, I'll have to buy a bigger freezer. Tue, Feb 19, 2013 : 1:36 p.m. I'd give you two thumbs up for specifically mentioning those steamed pork buns, if I could. I love those things. Tue, Feb 19, 2013 : 11:13 a.m.
Nooooo! Where am I going to get custard buns or BBQ pork buns?